The Tax Cuts and Jobs Act of 2017 (TCJA) created a number of changes to the tax code that impacted agricultural producers and agricultural cooperatives. One aspect of the provision, Section 199A was controversial and led to a revision. This process has led producers to wonder whether the tax implications should influence their decisions for delivering grain at harvest. The short answer is – probably not. To fully explain the issue, it is necessary to briefly discuss the tax reform provisions, including the elimination of the previous Section 199 deduction and the newly redesigned Section 199A deduction. TCJA included several tax changes including: (1) A reduction in the corporate tax rate, (2) Elimination of the Domestic Production Activities Deduction or Section 199 and (3) A new tax deduction labeled Section 199A. Section 199A provided tax benefits for pass-through entities including agricultural cooperatives. The original Section 199A language in the TCJA became controversial because it raised the possibility that a producer who marketed commodities through a cooperative might receive greater tax benefits compared to one who sold to an investor-owned corporation (see AGEC-1073 Impacts of Tax Reform on Agricultural Cooperatives, Briggeman and Kenkel, 2018). Due to that issue, which was often described as “The Grain Glitch,” a revision to the Section 199A Deduction was included in the March 23, 2018 omnibus spending bill. As background, it is useful to understand the basic concept of cooperative taxation. For federal income tax purposes, a cooperative computes its income similar to any other taxable corporation except that it can exclude certain distributions of members’ profits (which is termed patronage refunds) from taxable income. Cooperative members include those distributed profits in their taxable income. This creates a pass-through taxation structure. Due to that structure, cooperative firms do not substantially benefit from a reduction in the corporate tax rate. Because the TCJA reduced the tax rates for most corporations from a top rate of 35 percent to 21 percent (a 40 percent reduction), cooperative firms argued that the act should contain some provision for pass-through taxation entities in order for the act to avoid creating a disparity between cooperatives and investor-owned agribusinesses. In particular, the cooperative industry argued that the Section 199 deduction should be retained for cooperative firms. The Section 199 deduction, also called the Domestic Production Activities Deduction (DPAD) originated out of the American Jobs Creation Act of 2004 and created a tax deduction for domestic manufacturing and production activities. It also applied to agricultural producers, because they were considered to be manufacturing agricultural products. Agricultural cooperatives could also structure their payments for commodities such that the cooperative was considered as having collectively manufactured the products on behalf of the members. In that case, the cooperative could take the reduction at the cooperative level or pass all or part of it to the members. Because the Section 199 deduction was limited to 50 percent of W-2 wages associated with the agricultural production, it was typically more advantageous for the cooperative to take the deduction, then pass on all or a portion of the deduction to their members. The TCJA eliminated the Section 199 deduction for most firms to partially offset the revenue loss from the reduction in the corporate tax rate. In recognition of the fact that TCJA did not benefit cooperatives or their farmer members, the act created the Section 199A deduction, which was subsequently amended. The revised Section 199A language eliminated the partial deduction on profits or commodity payments that producers received from a cooperative. Therefore, it eliminated the most controversial provision. Some people viewed this as creating a disparity between cooperative and investor-owned agribusinesses. The revised Section 199A language provides a deduction at the cooperative level that the cooperative can retain or pass on to patrons. Section 199A provides all producers, except those farming as a C-corporation, with a 20 percent pass- through deduction. Farmers marketing through a cooperative face a reduction in their pass-through deduction. The potential reduction in the cooperative member’s 20 percent deduction was presumably designed to account for the deduction that the cooperative could pass on to the members. An agricultural cooperative can receive a deduction equal to 9 percent of its qualified production income, less the costs of goods sold and other expenses associated with that income. However, the deduction is limited to 50 percent of the cooperative’s W-2 wages tied directly to those departments that can generate qualified production income. The definition of qualified production income is complex but basically involves the revenue from commodity sales less the costs of goods sold and expenses related to those sales. Cooperatives can structure payments to producers for commodities in a form that is not considered cost of goods sold. In that case, the effective deduction is often limited to 50 percent of the cooperative’s W-2 wages tied to those commodity sales. The cooperative has the option of retaining the deduction or passing some or all of it on to their patrons. All producers farming as pass-through businesses which include sole proprietorship, partnership, LLC or S-corporations can receive a business deduction equaling 20 percent of their net income from commodity sales, but not exceeding their taxable income. The deduction is restricted when the taxable income exceeds $157,000 for individuals or $315,000 on a joint return. If the producer markets commodities through the cooperative, the 20 percent deduction is reduced by the lesser of 9 percent of the producers qualified business income or 50 percent of the W-2 wages paid by the farmer to employees who help produce qualified commodity sales. Table 1. Analysis of Section 199A Effect on Producer Delivering Grain to a Cooperative. As discussed, agricultural producers operating in any structure other than a C-corporation receive a 20 percent deduction on their income from commodity sales subject to taxable income limits. Producers who market commodities through a cooperative face both a possible reduction in their 20 percent deduction and a possible increase in their deduction because of the cooperative passing through some 199A deduction. The advantage or disadvantage of marketing commodities through a cooperative depends on the balance of those effects. A valid comparison can be made by using the best information on a representative cooperative and representative producer. The most recent (2016) USDA Agricultural Cooperative Statistics can be used to determine the sales, margin, labor expense, local savings and potential Section 199A pass-through for the “average” grain marketing cooperative. The most recent (2013) Economic Research Service report on wheat production costs can be used to determine the total revenue, W-2 wage expense and yield of an average wheat farm in the Southern Plains. That data makes it possible to make all the necessary calculations for the Section 199A deduction and patronage at the cooperative level and the possible tax deduction offset at the producer level. Table 1 shows these effects on a per bushel basis, which provides a very simple and understandable comparison. The average wheat cooperative has a labor expense of just under $0.15 per bushel (line 7), which means that the 50 percent of W-2 wages is the binding constraint on their Section 199A deduction. The cooperative would generate a $0.073 per bushel total Section 199A deduction (line 17), which could be retained at the cooperative level or passed on to the producer. The cooperative would also generate $0.072 per bushel of patronage which would translate to $0.036 per bushel cash patronage assuming a 50 percent cash/qualified stock distribution (line 13). The average producer’s reduction in their 20 percent deduction is also limited by their W-2 wage level and is $0.061 per bushel (line 33). Cooperative delivering producers who have W-2 wage expense of less than $0.15 per bushel ($4.79 per acre at the assumed average yield of 39 bushels per acre) would face a lower reduction in their Section 199A 20 percent deduction. A producer with no W-2 wages would maintain the full 20 percent deduction and any Section 199A pass-through or patronage from the cooperative would place them at an advantage over an independent delivering producer. Conversely, producers with higher W-2 wages would have a greater potential reduction in their 20 percent deduction and a greater need of a Section 199A pass through and patronage from the cooperative in order to maintain equivalence with the independent delivering producer. The prevalence of grain farms with sufficient W-2 wages to face the full potential offset to their 20 percent pass through deduction is addressed in a subsequent section. On the cooperative side, a cooperative with higher labor expense and the same profitability (an unlikely combination) would be able to generate a higher Section 199A pass through with the same cash patronage. A cooperative with higher profitability would be able to distribute a greater level of cash patronage. For comparison purposes, our average wheat marketing cooperative had a return on assets of 4.6 percent and a return on allocated equity of 18.26 percent. Who are these high wage paying farmers? And what determines “high” wages? While the total dollar amount of W2 wages paid by a farmer that would be deemed high will vary across farms, the ratio of wages to qualified business income will remain constant. That is, a high wage farmer will be a situation where 50 percent of their W2 wages will exceed 9 percent of their qualified business income. At that point, 9 percent of qualified business becomes the binding factor in the offset to the 20 percent Section 199A deduction when selling to a cooperative. Farmers with high W2 wages tend to be large, non-corporate producers. According to the Kansas Farm Management Association (KFMA) data on Kansas agricultural producers, each year since 1980, about 20 percent of Kansas producers had high wages. 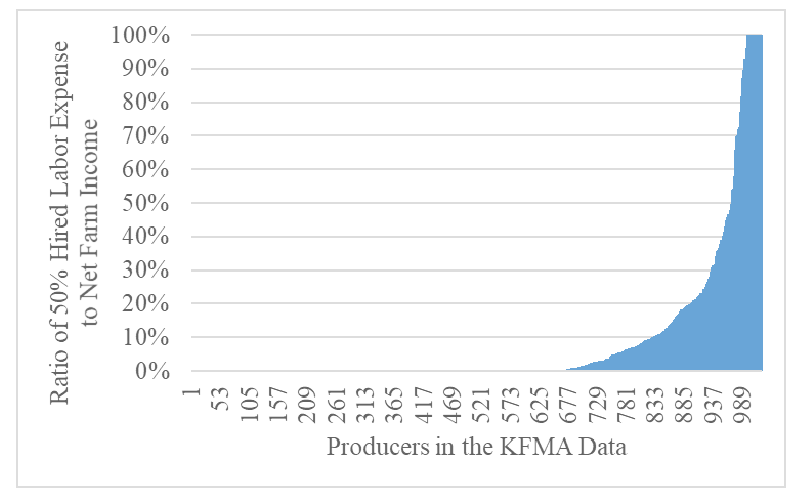 Figure 1 shows the distribution of producers ordered by their 50 percent to hired labor expense:net farm income ratio. While this is a proxy for the actual calculation, i.e. all labor is assumed to be paid as a W2 wage and net farm income is the qualified business income, one can gather some additional insights. These high wage producers had an average total labor expense equal to about $75,000. On average, these operations had nearly $1 million in value of farm production, over $4 million in assets and nearly all qualified for the Section 199A deduction (only 11 percent were C-Corporation farmers). Figure 1. Histogram of Labor:Income Ratio for Producers in the Kansas Farm Management Association Data, 2016. Historically, producers have not known the eventual patronage distribution at the time they make the decision to deliver grain to a cooperative elevator. Those patronage benefits are part of being an owner in the cooperative, and ownership benefits are always dependent on profitability. The tax reform process created another distribution, the Section 199A pass-through, which also cannot be determined at the time that grain is delivered. These results suggest that the tax difference between delivering to a cooperative or independent elevator is likely to be relatively small. Cooperative boards of directors are likely to make decisions on Section 199A pass through such that most cooperative members will be equivalent or better off by continuing to patronize the cooperative. Producers should consider the entire value package as they make decisions on where to market commodities. In general, it does not appear that the Section 199A tax effect should be a major factor in that decision. Briggeman, Brian C. and Philip Kenkel, “Impact of Tax Reform on Agricultural Cooperatives,” Collaborative Research KSU/OSU Fact Sheet, January 2018. USDA Rural Development, “Agricultural Cooperative Statistics 2016, Service Report 80, December 2017. Vocke, Gary and Mir Ali, “U.S. Wheat Production Practices, Cost and Yields: Variations across Regions, USDA Economic Research.